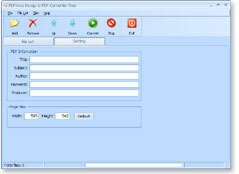 Previously we mentioned about PDF To Text Extractor v1.10, now there is another software utility that can help to convert image files into PDF format. Named as PDFArea Image to PDF Converter, it is a simple yet useful tool targeted for those that would like to change any picture files (TIF, JPG, BMP, PNG, GIF and more) to PDF format in simple steps. Once download and install the application, just launch it and you are ready to go. Click on ‘Add’ button to add as many image files as you need, then click on ‘Convert’ button and it will do the conversion in batch with only two simple clicks. Immediate after the clicking on ‘Convert’ button, a directory folder will be prompted for user to select where to store the converted PDF files. Only one limitation especially when dealing with huge image file, the default page size may not be sufficient and some of the portions of the images could be cropped if the page size is not adjusted correctly. Anyway, users can customize it by going to ‘Setting’, then key in respective Width and Height under Page Size section. The software utility doesn’t depend on Adobe Acrobat software and is compatible with all Windows OS ranging from 95, XP and even Vista. It consumes merely 3MB and you can download it free here for immediate use.